The Carbonator 500 Demo Tour Rolls On! Last week, ROI kicked off our west coast demo tour of the new Carbonator 500 at Integrated Biomass Resources in Wallowa, Oregon. The Carbonator 500 was introduced to a group of 60-70 onlookers, including members of the Oregon senate, putting our patent pending Carbon Negative Process on display! This unit will make its way down the west coast from Washington State, through Oregon and onto Tulare, California for the World Ag Expo where it will be proudly displayed. WHAT IS THE CARBONATOR 500? The Carbonator 500 is ROI’s revolutionary Carbon NEGATIVE solution to cost effective conversion of wood debris to Biochar. The Carbonator 500 is the most advanced, cost effective and environmentally friendly wood debris conversion system ever built. Wood and other suitable biomass is converted into high quality biochar at high throughput rates, utilizing the biomass as its own fuel source for Carbonizing. Designed to accept trees, brush, stumps and other wood debris without grinding or chipping. 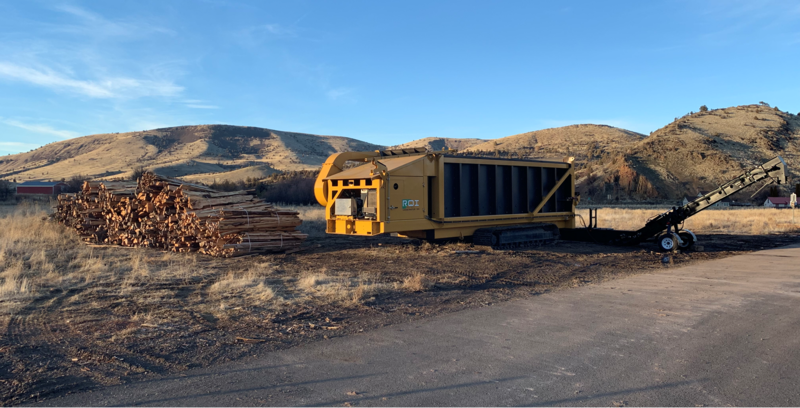 ROI’s team spent the last few years designing and constructing the carbonizer line of equipment to address the challenges associated with reducing the carbon process footprint from commonly accepted wood debris. ROI’s patent pending Carbon Negative Process is the only available Single-Step recycling system that reduces the processing carbon footprint to less than neutral, having a net effect of removing CO2e emissions from the atmosphere. Every other alternative process adds CO2e emissions to the atmosphere, some much more than others. The Carbonator 500’s carbon negative technology properly reduces volume by approximately 90% while reducing debris into a valuable high grade Activated Carbon or Biochar, based on the customers desired material outcome. When wood and vegetation is converted to biochar utilizing the Carbonator 500, the process footprint is NEGATIVE. 240-330 pounds of atmospheric CO2e is reduced per ton of carbonized debris. Carbonator 500 units are currently in production and will be delivered to customers across the United States and Canada. For questions or more information on the Carbonator 500, please contact sales@roi-equipment.com.